Tomorrow, Trevor and the rest of his fellow Bears (3rd grade) will bridge to the next level of Cub Scouting, Webelos (4th grade). It's been an amazing year. I'm looking forward to scrapping his many adventures. I'm also eager to share his final progress with the Academic and Sports program that has now ended. First, however, I needed to get his Wolf year scrapped. It had been sitting on my desk unfinished for a long, long time. It feels great to have it done and in the album. I'm going to challenge myself to get his Bear year scrapped sooner than the day before his Webelos year is coming to an end! Loveeeeee this! LOVING all the photos you incorporated!!!!! 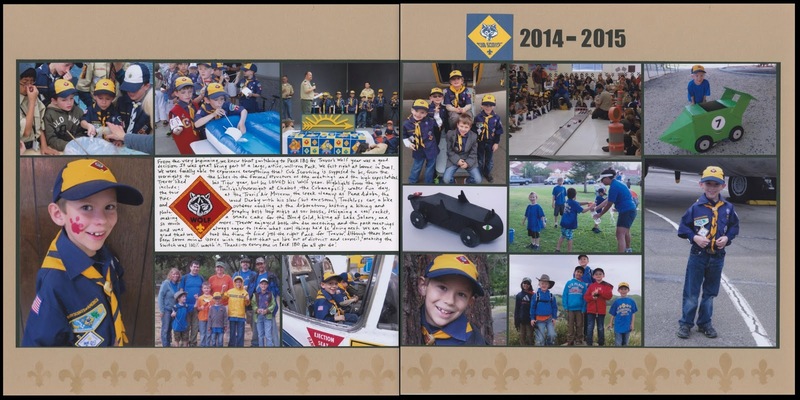 It looks like he had an amazing time in Cub Scouts! You always do such a fantastic job getting a bunch of photos on one page. This is awesome! I love your blocked theme and how you commemorated this year in your 2-page scrapbook page! Looks like it was a wonderful year!! !